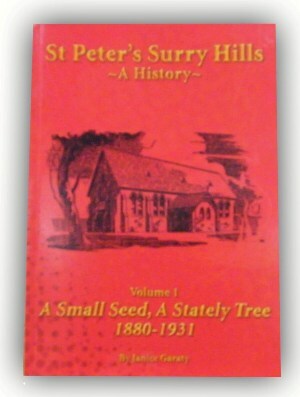 The Catholic Church and parish of St Peter’s Surry Hills was established in 1880. It arose out of the need to serve a very densely settled and highly Catholic Surry Hills, which had a strong Irish population. Until 1880, Surry Hills local residents often had to walk long distances to mass. Residents had the choice between four different churches, St Mary’s Cathedral (built in 1821), Sacred Heart Darlinghurst (1850), St Francis’ Haymarket (1867-1910) and Mt Carmel Waterloo (1859). On the 19th of September 1880, Archbishop Vaughan laid the foundation stone of the church-school of St Peter at Surry Hills in the presence of about 4,000 people among whom were several of the leading citizens of Sydney. The first Mass in St Peter’s was celebrated on Christmas Day 1880 but the formal opening and blessing of St Peter’s by Archbishop Vaughan had to wait until 11 September 1881, when the church had been paid for. Fr James Fleming was the first appointed priest to St Peter’s Surry Hills, but as there was no presbytery built on the land at the time, he resided at St Mary’s Cathedral in the city.